ALINE’s ALINEment™ System has broken the mold of insole design in creating an engineered suspension system — for your feet. In a market dominated by handmade and expensive orthotics, ALINE is an industry leader in lower extremity alignment. ALINE uses innovative technology and years of footwear design and orthotics fabrication experience to optimize performance. ALINE insoles support and shape the foot to enable optimal alignment in all phases of motion and activity. Now, in just five minutes, you can deliver the technology your patients need to perform in sports and in life. ALINE has worked with over 100,000 people and found that the majority have lower extremity misalignments. Misalignments are a big health issue, and a big business opportunity for your practice. ALINE’s technology is proven as the “Foot Services Provider” to ESPN’s X Games, PGA Tour players, NFL players, Olympic gold medalists, and as an Official Sponsor of the IMG Academy. ALINE uses patented bFAST® and RibTech™ technology. Dynamic ribs flex, supporting the foot during explosive moments of athletic performance and daily motion. And ALINE’s suspension zones enable the foot to maintain its optimal shape during the gait cycle to maximize performance and reduce injury. With ALINE’s patented Laser ALINEment Device, you can immediately show your patients their misalignments and develop a program to help them, equipping you with a powerful diagnostic, communication, and sales tool. Plantar Fasciitis is a common painful disorder affecting the heel area and underside of the foot. Approximately 10 percent of people will have plantar fasciitis at some point during their lifetime. It is associated with activity or long periods of standing. Patients suffering from Plantar Fasciitis have difficulty with the dorsiflexion of their foot (foot lifted toward the shin). The DARCO DCS Plantar Fasciitis sleeve is woven to be anatomically correct and provides 15 to 30 mmHg of compression focusing on specific areas of the plantar surface of the foot. The wave compression technology on the plantar surface of the foot provides a sustained stretch on the plantar fascia. The DCS PF gives relief from the pain and discomfort associated with plantar fasciitis by promoting circulation, reducing edema, foot fatigue and early morning foot pain. The DARCO DCS PF compression sleeve is easy to wear and very well tolerated by the patient. It can be worn under socks and in regular shoes. They are sold individually and may be worn on the right or left foot. Sizes are based on shoe size or arch circumference. It is no secret that obesity is a growing problem and according to the World Health Organization, more than 300 million people worldwide are overweight or obese. Along with other health complications associated with being overweight, such as heart disease and diabetes, the body and feet can also be negatively affected. Chiropractic care along with the individually-designed Stabilizing Orthotics can work to prevent and treat the conditions associated with obesity. Extra weight applies more pressure on the feet and can cause the arches to collapse, leading to joint and back pain. The deterioration of the joints, also known as osteoarthritis, is the leading cause for knee and hip replacement surgery. These conditions can be prevented with the help of Stabilizing Orthotics from Foot Levelers. Stabilizing Orthotics support all three arches of the foot to help align the feet, ankles, knees, hips and spine to provide a balanced foundation for the body. The individually designed postural support also helps to reduce back and joint pain. Orthotics are an important adjunct to your care because they help your chiropractic adjustments hold longer, helping prolong your patients’ wellness. A healthy diet and regular exercise are both important factors to discuss with your patients to help them lead a healthy lifestyle. Along with regular adjustments, your chiropractic care can include nutritional, dietary, and lifestyle counseling. The RX24 Quadrastep system is a revolutionary and tailored approach to treating various foot types. For the past 10 years, inventor Roberta Nole, MA, PT, CPed has been treating and casting patients, evaluating symptoms, comparing gait, evaluating casts and fitting patients. She is the owner of Stride Custom Orthotics & Pedorthic Center specializing in biomechanical gait examination and rehabilitation of the foot and ankle. This research resulted in the creation of a patented clinical algorithm that identifies and categorizes a patient's feet into one of 24 foot-types. A patient's foot-type will influence not only their gait but the conditions and pathologies that afflict them throughout their lives. The RX24 Quadrastep systems takes the concept a step further and simplifies the 24 foot-type medical model into six sub classifications known as quads that groups together four similar foot types. Each quad has its own very specific foot and gait characteristics. These foot types include severe pes cavus, mild pes planus, neutral, moderate pes planus, abductovarus forefoot and severe planovalgus feet. 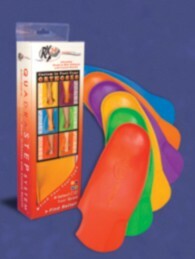 These six quad specific functional orthoses are biomehanically tailored to that of a true custom prescription. To provide superior patient education, a quad-specific information card is included with each pair that features possible clinical symptoms, key foot attributes, gait characteristics and more. The RX Quadrastep system is easy to learn and can be quickly applied in a clinical setting. It also eliminates the need for costly and messy foot impressions that are often prone to error. The devices can be stocked in-house ready for immediate fitting. For the first time, clinicians can classify a patient's foot type and dispense prescription based orthoses within minutes. Providing affordable ready to wear orthoses with custom results just became possible. Ontario Orthotic Lab has announced the launch of their extensive line of custom orthotics and brand name footwear to the U.S.A. The new company headquarters is located in Michigan, enabling faster turn around times, no customs clearance, and PRICES that are still in CANADIAN DOLLARS!!! New for spring is an exciting line up of sandals and footwear from Naot, Florsheim, and Asics to name a few. 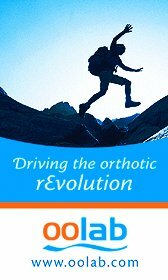 Take your office orthotics program to the next level, while increasing sales, patient satisfaction, and referrals by providing some of the best footwear and orthotics programs in the world. Ontario Orthotic Lab offers: free delivery; volume discounts; practitioner specials and office and family discounts; support with on staff techican for collaboration; some of the best customer service in the industry. Powerstep® is a leading brand in the prefabricated orthotic market. Powerstep orthotics have been clinically proven to improve foot function, decrease foot pain, increase sense of stability, and improve comfort regardless of the nature of the presenting complaint; and it is one of the top brands most prescribed by podiatrists. Established 25 years ago, Powerstep manufactures the highest quality orthoses for preventing and relieving the most common foot problems. The key to the company's success has been a combination of effective, affordable podiatrist-designed products and outstanding customer service. 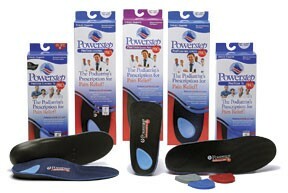 Over 4,000 medical professionals prescribe Powerstep ProTech orthotics. The ProTech line is only available to medical professionals, and in-office dispensing allows doctors to offer patients immediate and affordable pain relief. The Powerstep ProTech line features a full assortment of medical-grade polypropylene supports to meet all prefabricated orthotic needs. These orthotics feature arches calibrated with flexibility, dual-axis foot control, and stabilizing heel cradles with Poron® cushioning to provide first-line therapy for plantar fasciitis, heel spurs and other conditions — relieving heel and arch pain, as well as knee and lower back pain. Powerstep products are accepted by the American Podiatric Medical Association. Powerstep's mission is to provide the most effective products available for preventing and relieving common foot problems. 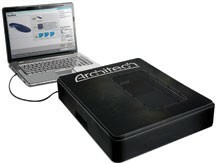 The Orthotic Group, an innovator of digital casting technology, has launched the new Architech™ system representing the latest evolution in foot scanning. Designed for release in 2012, the Architech system and software was developed to meet to the needs and realities of today’s practitioner. With state-of-the-art and easy-to-use client software featuring dynamic 3D patient education models, Architech makes orthotic design and ordering a simple process, saving you time and money. The main features of the Architech include Easy Scan Software, 3D Patient Education Video Technology, Smart Ordering System, Foot Evaluation and a Comparison Capability. To get started with the Architech system, please call the The Orthotic Group’s customer service team at 800-551-3008 to be connected with one of their dedicated account managers. A representative will be happy to schedule an Architech demonstration online, in-person or over the phone to show you how this revolutionary technology can benefit your practice. The foot can have a powerful impact on the rest of the body. When the foot is out of alignment, it can put the body's skeletal structure under severe stress and cause pain with the neck, back, hip and knee, not to mention the foot itself. Correcting and controlling the alignment of the foot's 26 bones as well as the connecting ligaments, tendons and muscles while still allowing the foot to walk, stand, jump and run--is a tall order. It requires a special combination of flexibility and strength, and other orthotics and insoles are simply not up to the task. Beginning with a thorough examination and biomechanical assessment that considers positional relationships and joint mobility, the clinical procedure for turning a prefabricated shell into a functional orthotic is no less demanding than fabricating a custom orthotic. After posting and covering, orthotics fabricated from Nature-Fit shells remain exceptionally thin allowing them to be worn in just about any style of footwear from athletic shoes and boots to the most elegant pump. Nature-Fit's unique combination of extraordinary strength and long-lived memory allows a clinician to fabricate orthoses for a majority of patients without considering age, weight or level of activity or lifestyle including those fabricated into custom orthotics by molding them to a positive cast. Nature-Fit uses a proprietary polymer formula. It is injection-molded to deliver a non-porous, ultra thin product that fits in virtually any shoe. It is preformed with or without metatarsal support for quick adjustment. This allows you to provide the best quality orthotic backed by a Lifetime Guarantee.